Everyone who says to lighten up because of the source of the sneaker concept, this did not fare well with me either. Scott obviously showed a cultural and historical ignorance in designing these, and Adidas obviously lacked staff who would be able to see the inappropriateness of this. However, when I looked at that monster, I still feel as if that social connotation might still implicit there. 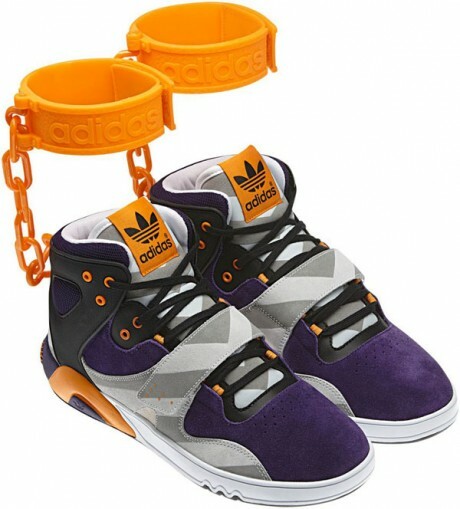 First, why would he think having ankle chains on a pair of sneakers was fashionable because of this toy and in general. Also, it looks uncomfortable. Second, since there is also a history of calling Black men brutes and Black people animals, his reasoning behind the design still was not a good idea if that is the target customer base. As Shelly Bell said in her post, “some distasteful ignorant producer would have had the bright idea to put them on a bunch of black men dressed like monsters and made a ‘FASHION’ scene out of it.” I need people to learn that having eccentric and outrageous designs does not give one permission to be insensitive or ignorant of others or just be completely unnecessary. In the future, I need companies think before acting and do research on who you are selling to — that is Marketing 101. It is not about being outright racist or having good intentions, it is about the representation of the symbols for specific communities who will be buying these products. At the end of the day, it is not about you!